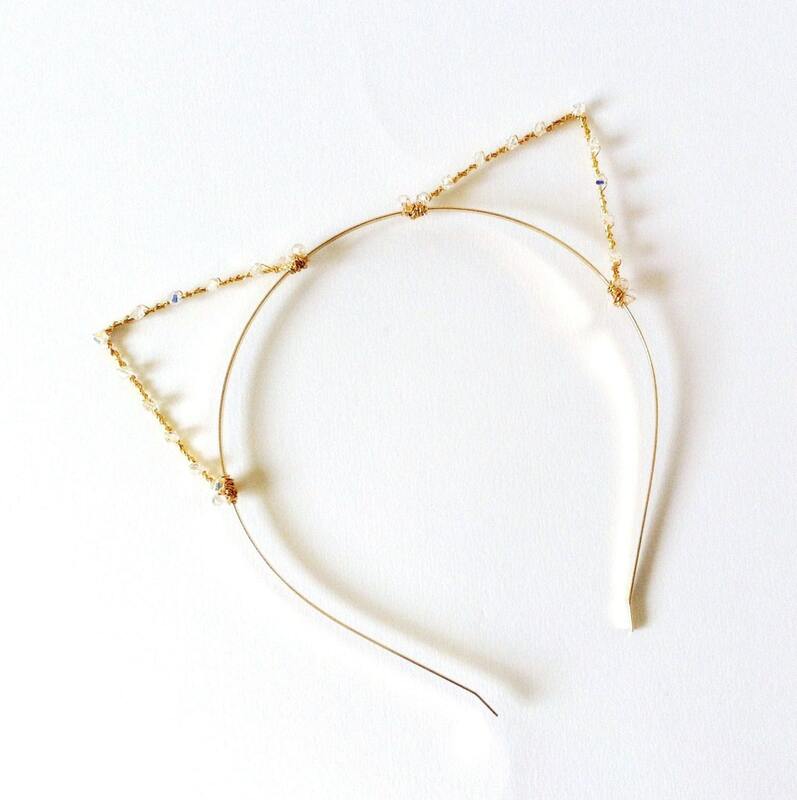 The newest trend in headbands, regardless of age, is cat ears. They’re easy to make and can be worn with or without a costume. Best of all, the materials are extremely inexpensive and most can be found right in your home. 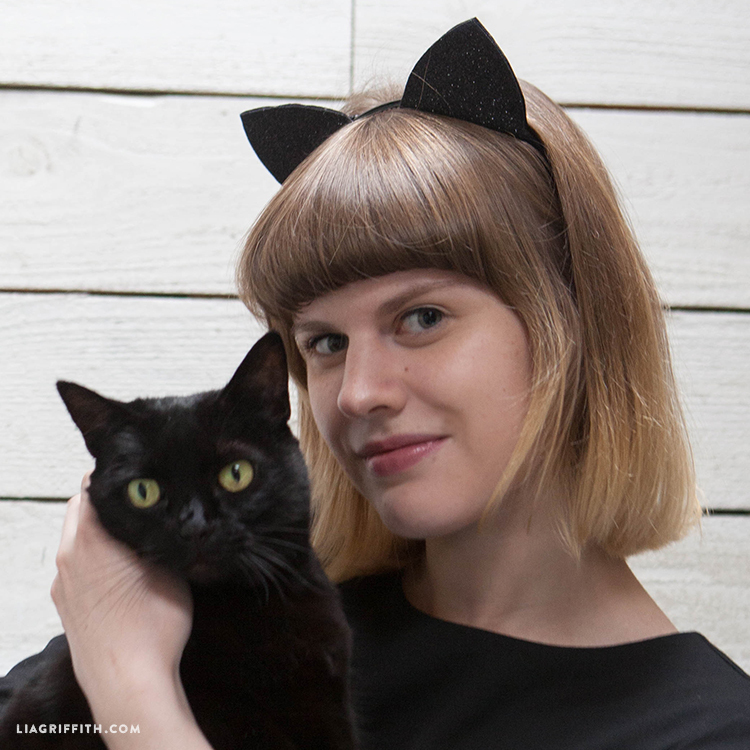 Learning how to make cat ears headband is really easy and can be a fun activity for children as well as adults. Here are a few of our favorite options. These ears are subtle but add a little sparkle to your hair. 21 gauge jewelry wire the same color as the headband. E-6000 jewelry glue or hot glue gun and rods. Cut 2 pieces of wire 7″ long (You can also cut it longer or shorter depending on how big you want the ears). Bend them in half forming a triangular shape that looks like a cat ear. Lay one wire over the other and adjust so they’re the same size. Trim if needed. Wrap the fuzzy metallic wire around the bent wires gluing it at the beginning and end so it stays in place. Position the ears on the headband and make marks where the wires will be attached. Take an ear and line the wires up with the marks. Bend one side of the wire over the headband then use the pliers to wrap it all the way around and tighten it. Do the other side the same way. Put a dot of glue where the ear wires connect with the headband so they don’t move around. With the headband laying on the table, lay the rhinestones out so they are spaced evenly. Glue the rhinestones to the wire and let them dry completely before wearing the headband. Note: Remember that E-6000 glue is very strong so be sure and work on a paper towel or other disposable surface. Also wash up as soon as you’re finished if you get any on your hands and don’t put the headband on until it has dried completely. If you’ve got some construction paper laying around, a few minutes and creativity could give your headband a whole new look. A headband the color of your hair. Pink and black construction paper. Draw two equilateral triangles on your black construction paper that have 3″ long sides then add 1/2″ to the bottom. Draw two equilateral triangles on your pink construction paper that have 2″ long sides. Cut out all the triangles and place the two black together and the two pink together. Make sure they are the same size. Trim any parts that don’t line up. Glue the pink triangles into the center of the black triangles. Fold the bottom along the bottom line of the triangle. This is how you will get it to stay on the headband. Attach your ears to the headband by placing a bead of glue along the creased portion of the ears and laying them flat against the bottom of the headband so that they sit flat and are lined up in the center of the band. Any section of the ears that extend beyond the headband can be rolled up and glued on the top. Allow them time to thoroughly dry before putting them on. Once you put them on, comb or brush your hair to cover the headband. Even Ariana Grande has jumped on board the cat ears train. You can find her wearing any number of styles. These are sequined. Cut two lengths of wire 7″ long and bend each in the middle to form the points of the ears. Make sure they are even and the same size. Trim if necessary. Use the tip of the pliers to roll the ends of each wire. Attach it to the headband by hooking the band on the curled wire then use the pliers to pinch the wire tight. Make sure before tightening that they are centered on the headband. Put a dot of glue on the end of the sequined ribbon and press it against the wire on the back at the tip of one ear. Make sure the sequins cover the tip of the ear. Wrap the ribbon around and around the ear toward the headband applying dots of glue occasionally until you get to the bottom. Wrap the ribbon around the headband on each side to cover the curled wires then put a dot of glue on the back at the bottom and cut the ribbon off. Hold it in place until it dries. Complete the other ear the same way as the first. Make sure the glue has dried completely before putting it on. For a more subtle but elegant look you might want to try this one. Silver bugle beads (they’re cylindrical instead of round). 21 gauge jewelry wire the color of the headband. Cut 2 lengths of wire 7″ long. Bend them in the center to make the ears. Line them up to make sure they are the same size and trim any excess if necessary. Thread the beads beginning with a pearl then followed by a bugle bead. Alternate pearl and bugle beads until you get the bottom of one side of an ear being sure to leave 1/2″ at the bottom of the wire for curling. Do the other side the same way then curl both ends to keep the beads in place. Note: If you hold the wire upside down while working on it the beads will stay on tight until the bottom has been curled. Place the ears on the table and lay the headband on top of them. Make sure they’re centered. Use the pliers to roll the wire the rest of the way around the headband then pinch it tight. Complete the other ear the same way. Put a dot of glue on each curled wire to hold it in place on the headband. Do not put it on until the glue has thoroughly dried. This one is super easy and can dress up any outfit. Faux pearls, beads and rhinestones in one color. Small faux flowers in a contrasting color. Draw an equilateral triangle onto a 3×5 card and cut it out. Make 4 copies of the triangle on the black felt and 2 copies on the black foam. Cut everything out. Apply glue to one black triangle and place the foam triangle over it. Apply glue to the top of the foam triangle and place the 2nd piece of black felt on top. Press firmly a few seconds until dry. Glue all the way around the edges and press to seal. You have just completed one ear. Lay the headband on the table and center the ears on top. Note where they line up then place a bead of glue where the ears will go and press the ears in place. Hold a few seconds while the glue dries. Because this style is thicker it doesn’t need to wrap around the headband to stay on. 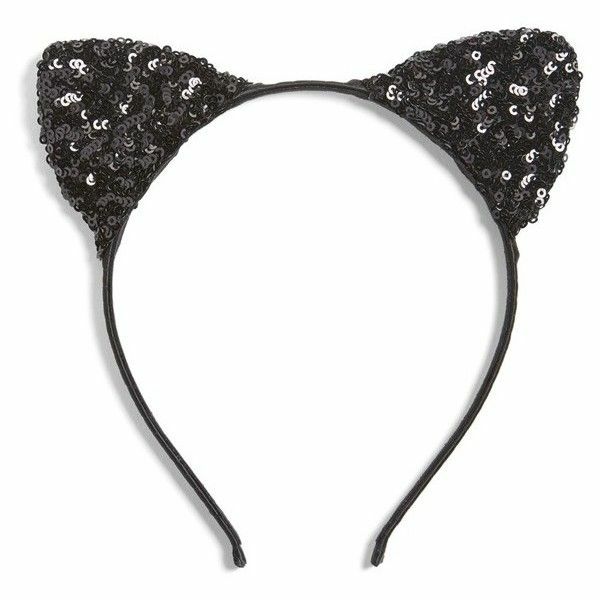 Lay the cat ear headband on the table then glue the pearls, beads and rhinestones randomly being sure to fill in all the spaces on the front. Glue faux flowers on the headband in front of one ear. You can also add a small ribbon bow among the flowers if you want. 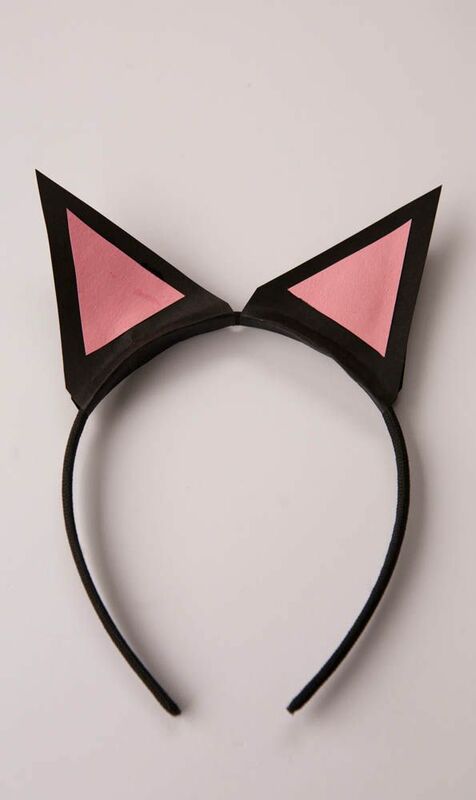 As you can see, learning how to make cat ears headband is super simple and it doesn’t necessarily require a lot of money. In fact, you can probably find the stuff you need to make them laying around the house. There really are no rules and it’s a great way to show your fun side to friends and family.